The most awaited Holiday season of the year is here, and you don’t want to miss the best shopping spots to cover up your shopping lists. Its already the December and you all must have started shopping for Christmas. Well, I don’t think so that any of you must have missed the Black Friday Sale. But, no need to worry if you have missed it. Here is the list of places from you can cover up your missed deals for Christmas Shopping. Be it a shopping mall, Christmas Markets or an online store grab the best offers in the UK for Christmas. The award-winning market with over 150 shopping stalls is going Green this Christmas Season. The perfect place for street shopping. You will find all the Christmas items are made locally. From clothes to ceramics to glassware and toys. You can also take a tour of Roman baths. 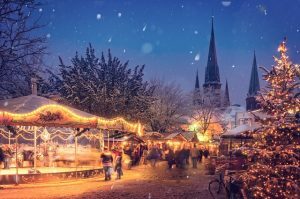 Bath Christmas Market has also voted the best market in 2017. The best sellers are handmade jewelry and knitted socks. Feed your hunger with tasty cheeses and gingerbread. Tip for Shopping at Bath would be shopping in Morning or a weekday. Every Saturday let your kid witness festive storytelling, Christmas arts, face painting. Take your kids to the Kids Café. Internationally Famous Birmingham Christmas Market is the largest German Market outside of Germany. Its famous for selling wooden toys and Christmas decoration. Completely inspired from Frankfurt, you can always take a view of this place from its Wheel. Stay Busy for hours with a feel of a village atmosphere. Enjoy your Christmas Shopping at St Enoch Square with multiple options of international goods. Enjoy Funfair rides and live entertainment and the gift shopping. You can experience the famous International food like Italian nougat. The most interesting of all the Christmas Markets. Enjoying exotic meat from around the world. Check out the gifting options provided by the local traders. It starts from 17 Nov to 22 Dec. Enjoy Belgium Chocolates, Baklava Crepes and well-known cheeses. As the countdown for Christmas has already begun Manchester Christmas Market has started from Nov 9 to December 22, Capture the best pic of Santa placed at the top of Town Hall. This market witness more than a million customers. Shopping Tip at Albert Square is to shop on the extra day which is 23rd December. The traders are willing to sell the last stocks and a bargain price. The markets are stretched in Albert Square, St Ann’s Square, King Street, The Corn Exchange, New Cathedral Street, Market Street. Visit Ice Skating Rink and Ice Village in Cathedral gardens. You will get a visual sight of ice sculptures. 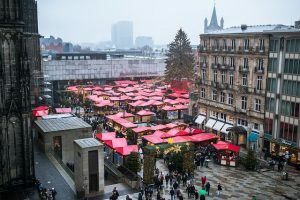 Enjoy your mulled wine and hot chocolate with your Friends and Family at this Festive Shopping Market. Download Reward Cards App and declutter your wallet. Start using this app and have a smooth checkout at the shopping counters. We will share the best Christmas Gift Ideas for men and places to buy those Gifts in this Holiday Season in our next blog.